A sunny day stroll through Plaça de Catalunya. The square anchors one end of Las Ramblas, so it flows with citizens and tourists, to-ing and fro-ing, talking and shopping. 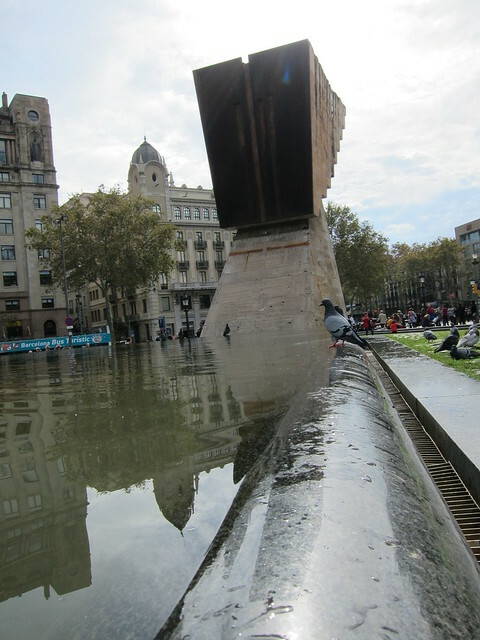 Beneath a ponderous blocky sculpture, pigeons ring around a pond. As I stoop down to snap a photo from a different angle, a large seagull swoops down and attacks a gray pigeon standing off by itself. Beak on wing, squawking, gnawing. I’m horrified by the bird-on-bird violence, relieved when the seagull flies off. But then the mangled pigeon flops forward into the pool. I walk away, not wanting to see it struggle and drown.